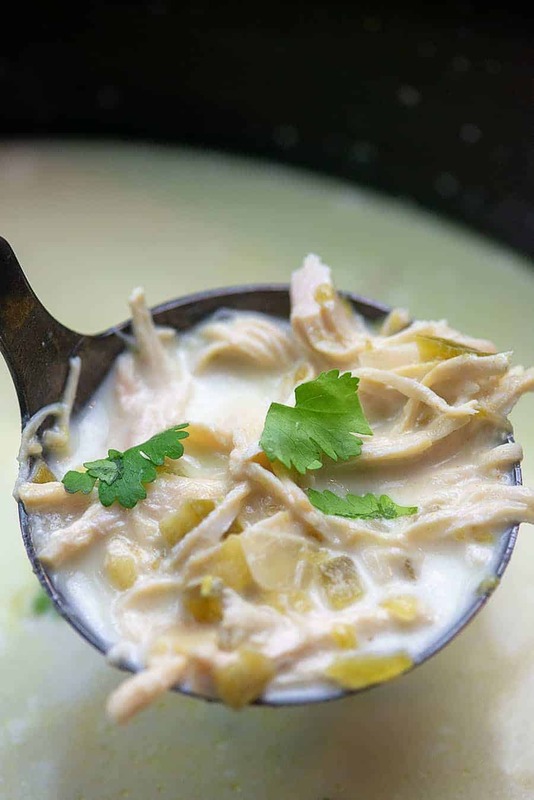 Crockpot White Chicken Chili – this low carb version of a classic is so creamy and filling. It’s simple to toss together and is a family favorite. I’ve got quite a thing for slow cooker soups going here. I just love how easy they are and my family always gobbles them. We like soup all year round – they’re warming and comforting in the winter, but they can be light and simple in the summer. I’m curious to hear if you guys eat soup all year round too? 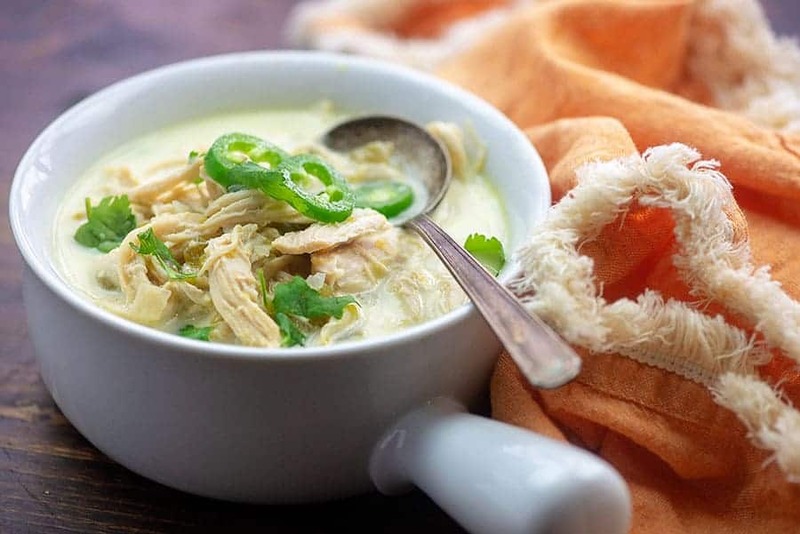 This white chicken chili recipe is one of those recipes that we’ll eat any time of year and the best part is that my entire family loves it and has no idea they’re eating a keto white chicken chili. It’s just a regular meal to them and I love when that happens. 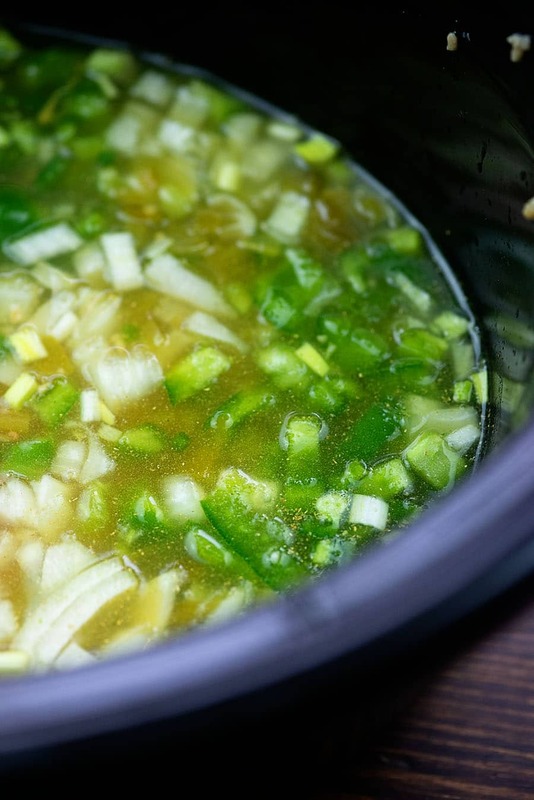 Add some chicken breasts, onion, bell pepper, jalapeno, green chiles, garlic, and cumin to a slow cooker. Pour in some chicken broth and give it a little stir. Cover and cook on high for 3 hours or on low for 6 hours or until your chicken shreds easily. It’s important to remember that every slow cooker cooks differently – some run hotter than others and cook times will vary. Shred the chicken and add in some softened cream cheese and heavy cream. It can be helpful to get the cream cheese very soft and almost melted in the microwave before adding to the soup. It will prevent it from clumping in the hot liquid. Stir well until everything is incorporated, cover, and cook on high for another 30 minutes. Your soup is ready to devour! 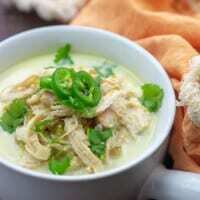 We like to serve our creamy white chicken chili with slices of avocado, jalapeno, and loads of cilantro. A dollop of sour cream on top is nice too. 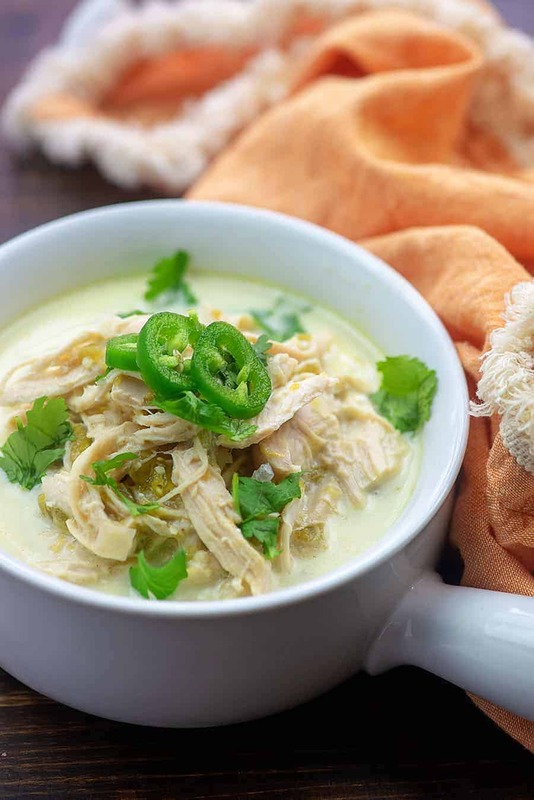 Is this white chicken chili recipe spicy? It has a nice little kick to it, but it was mild enough for my kiddos to eat without complain. If you’re concerned, reduce the jalapeno to half or leave it out entirely. 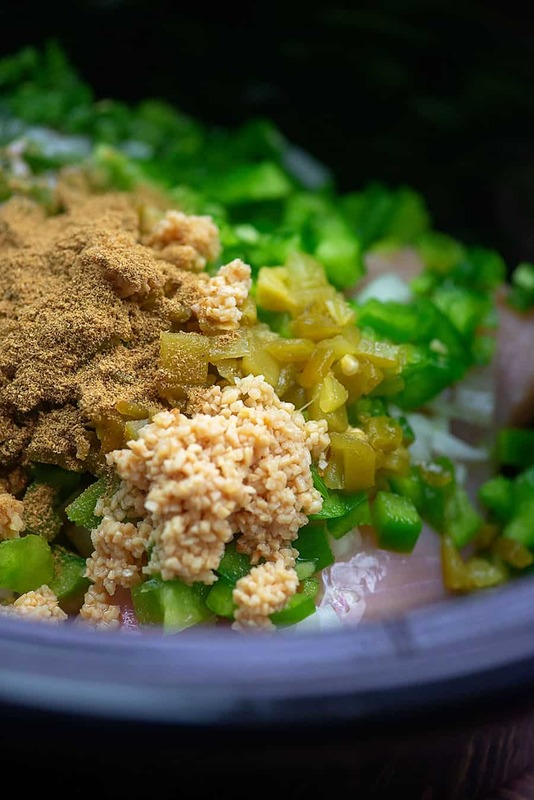 The canned green chiles add a great flavor and you can buy them in both mild and hot varieties, so don’t skip them! 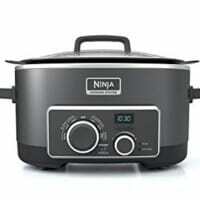 Slow Cooker: The Ninja 4-in-1 slow cooker is my favorite and I have A LOT of slow cookers. I like the shape, size, and even heating of this one. Plus it gets great reviews on Amazon. Crockpot Broccoli Cheddar Soup: The easiest way to get my kids to eat their broccoli! Cheeseburger Soup: Probably my favorite soup of all time! Cauliflower Soup: I roast the cauliflower first for extra flavor! Crockpot Cabbage Soup: Hearty and filling! 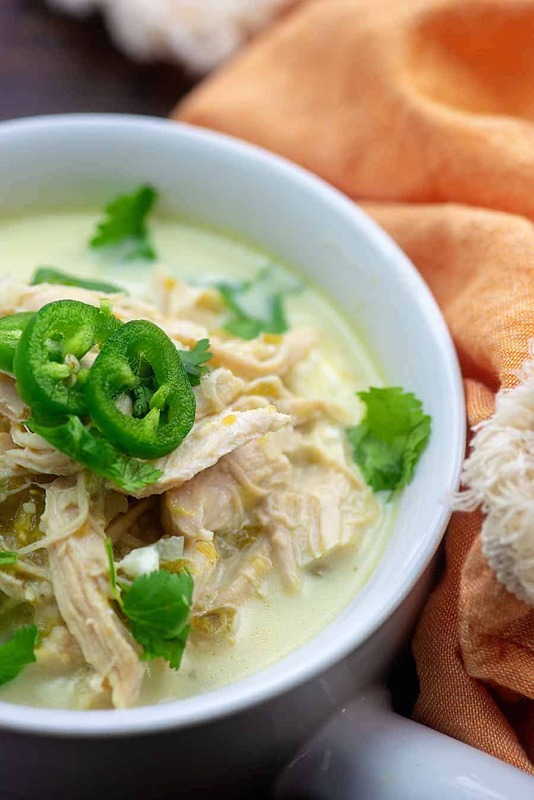 Creamy white chicken chili made low carb in the crockpot! Add the chicken, bell pepper, jalapeno, onion, green chiles, garlic, cumin, and chicken broth a 6 quart slow cooker and cover. Cook on high for 3 hours or low for 6 hours or until the chicken easily shreds with a fork. 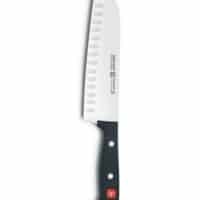 Shred the meat. Add the softened cream cheese and heavy cream to the slow cooker and stir well until the cream cheese has melted. Stir well before serving. Serve with avocado, sour cream, and cilantro, as desired. The softer the cream cheese is the quicker and better it will melt into the soup. Use the microwave to soften until it's nearly fully melted.